The pages are not numbered in this book, but Chapter I begins on the fifth page. Based on what you see on this page, what can you tell about the setting of this scene? Who lives in this home? What do the things shown on this page tell us about the people living in this home? How does the woman feel about what the man is doing? Can you find the objects from page 5 in this panel? (panel 5) What is the girl looking at? Do you think the family is safe or in danger? What do you see that supports that opinion? Why does the man give his daughter the bird? (panel 4) Why is the woman crying? (panel 6) What do you think the man is saying to the woman? How do you think the woman and the girl feel now? What are some reasons why the whole family didn’t get on the train? 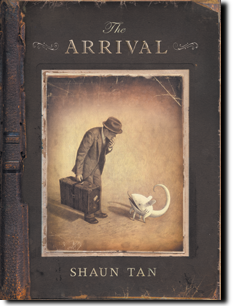 This entry was posted in Discussion Questions, Shaun Tan's The Arrival. Bookmark the permalink.